Centred on the appropriately named Spioenkop dam and mountain, the 6,000 hectare nature reserve is certainly not a top wildlife safari destination. The reserve is a place to go boating, fishing and exploring Anglo-Boer War battlefields, while enjoying regular sightings of zebra, giraffe and a variety of plains game. If you are fortunate you may see white rhino too, but this is certainly not a Big Five destination. Spioenkop is more of a historical and cultural safari experience. Spioenkop Mountain is renowned as the site of the infamous Battle of Spioenkop, which took place in 1900 with the British suffering one of their worst defeats of the war. The battlefield is accessible by road and the wrap-around view from the summit is impressive, especially the vista looking across the dam towards the imposing peaks of the Drakensberg Mountains. It is also worth noting that the northern section of the reserve is a designated controlled hunting area. I would bit recommend this as a wildlife destination per se. There is a good chance of seeing white rhino, giraffe and a long list of antelope (including the endemic blesbok) on the small road circuit through the reserve. It also offers some pretty good birdwatching. 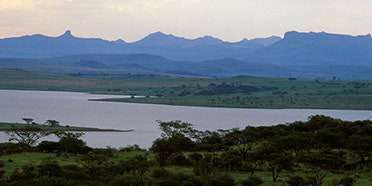 But the nicest aspect of Spioenkop is the scenery, comprising a lovely dam surrounded by dense acacia woodland at the base of Southern Africa’s largest mountain range, the uKhahlamba-Drakensberg. It is particularly recommended as a low-key wildlife break to hikers and walkers exploring the uKhahlamba-Drakensberg area, especially on a cold winter’s day, when the mountains themselves may be a rather chilly prospect. If you fall into that category, don’t miss out on the 1-2 hour hiking trail through lakeside hills studded with tree aloes that bloom bright orange in winter. You don’t go to Spioenkop for the animals. It does have some but this 4,400 ha/10,900 acre reserve in the western section of Kwazulu-Natal is really a daytrippers’ special in wildlife terms. The northern half of the reserve is sectioned off as a hunting preserve. The rest is somewhere that Durban city dwellers can come for picnics by the lake to see a few impalas, zebras and the odd giraffe. It’s a small reserve without any major predators or elephants and while it does have rhino, this is not where you would come for any serious gameviewing. It does make a pleasant afternoon out if you happen to be in the area. There is a lake where you can take out a boat. There are hiking trails. And you can go riding. The scenery is pretty and the views from the top of the kopje are wonderful stretching across to the distant Drakensberg mountains. It is the climb up the kopje that is the real draw here. I am no military history buff and was rather dreading my visit, but my guide was a compelling story teller and I was utterly spellbound as we stood amongst the rocks and he wove heartbreak and magic into the story of one of the most tragic and futile battles of the Anglo-Boer War. The British defeat here in 1900 is still remembered by Liverpool Football supporters who call one of their stands The Kop in its honour. So go, take an experienced guide, but don’t make the day about the animals. In this instance, they are an added bonus. Dominated by a prominent hill, this was the site of the famous Battle of Spioenkop, when in 1900 the British suffered one of their worst defeats during the Anglo-Boer War. I hiked to the summit which took about three hours (or you can drive up the paved road), where the graves are marked by mounds of white rocks. There were tremendous views across the glistening dam to the snow-capped Drakensberg Mountains. On the dam’s wooded slopes, I saw plenty of grazers and without any big predators and plenty of visitors, they were very relaxed – zebra, eland and giraffe looked up briefly to blink curiously. I didn’t see rhino or buffalo but horse-riders have been known to get quite close. A pleasant reserve close to the resorts in the northern Drakensberg, but half a day is enough to see the battlefield and perhaps have a picnic and swim. On paper this small reserve located in the foothills of the Drakensberg in KwaZulu-Natal boasts a wide variety of wildlife including white rhinoceros, giraffe and a variety of antelope. In comparison to other parks and reserves in province though, the game viewing is less than average. Then again, this is not the kind of place you come to purely for game viewing. With the Drakensberg as its backdrop it’s certainly very scenic. What I found most fascinating about the park is that it lies in a region that is that it is steeped in Anglo-Boer War history. Perhaps it’s because my great-grandfather fought here on the side of the British, but I really had that spooky feeling of the past coming alive. Spioenkop Mountain was in fact the site of the infamous Battle of Spioenkop which took place in 1900 where the British suffered one of their worst defeats during that period. Don’t miss the 360 degree view from the summit – it’s spectacular. This little park is mostly visited by South Africans for fishing and boating on the dam. There are some barbecue spots around the lake and during holiday time and weekends these are usually all occupied by midday. There is however also a little game drive circuit and there are quite a good number of grazers that can be spotted here. Giraffe, eland and blesbok are common and greater kudu can sometimes be spotted in the thickets. There is a small population of white rhino in the park as well. They often retreat to areas of the park inaccessible to the public, but at dusk you have a good chance of encountering them on their way to drink at the dam. There is a small hiking trail, which is spectacular in early winter when the very abundant tree-sized Aloe marlotii are flowering.